taking the Golden Cabinet Digestion Regulating Formula daily or even weekly may be beneficial as a means to harmonize one of the most important barometers of your health…your digestive processes. A healthy digestive system is one of the first areas most Chinese Herbalist will be concerned with. It is said that the strength of your Stomach Chi is what drives the life within your body. 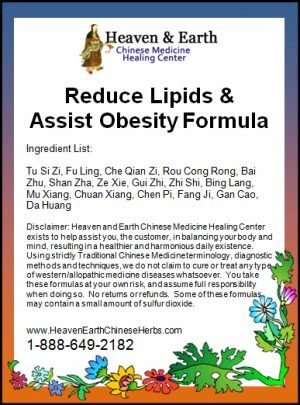 A healthy Spleen & Stomach Organ System is mandatory to assimilate water, food and other Chinese Herbal Formulas, especially our tonics. We at Heaven and Earth CMHC just cannot overstress the importance of the health of your digestion system! Brought my digestive system back into balance. As a result I feel stronger within a couple of days. My body can handle food better and my headaches disappeared as a result. Felt the result immediately after the first intake of the concoction, like my body was saying: Thank you! I noticed results after the first use. After three days the whites of my eyes were noticeably brighter (whiter). By day four I wasn’t feeling sluggish and my stomach didn’t bother me! This is by far the best solution to my recurring acid reflux. I have not a any symptoms since taking this tea! Received items promptly and informative emails. Easy to follow instructions. Will order again!